Apply 1L/ha at planting in furrow as close to seed as possible. Apply 2 x 1 L/Ha at planting, one month later, in furrow close to seed or transplant roots via fertigation system in shallow irrigation to target active root zone. Apply 3 x 1 L/ha at first root flush, mid Spring, late Spring via fertigation in shallow irrigation to target active root zone. Apply 3 x 1 L/ha at Budburst, 20cm shoot growth, flowering via fertigation in shallow irrigation to target active root zone. 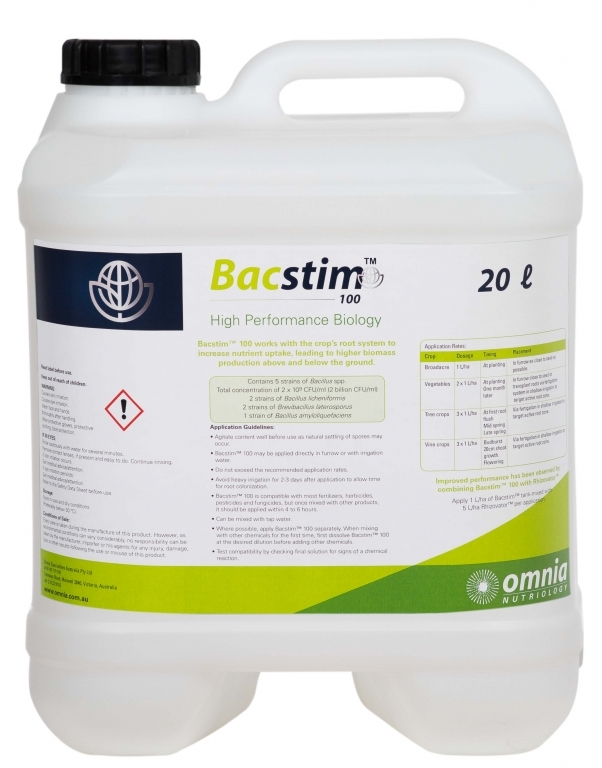 Apply 1L/Ha of Bacstim™ tank-mixed with 5 L/Ha Rhizovator™ per application.